Today we're taking a family car trip -- all in all the four of us will be in corolla together for about 7 hours. 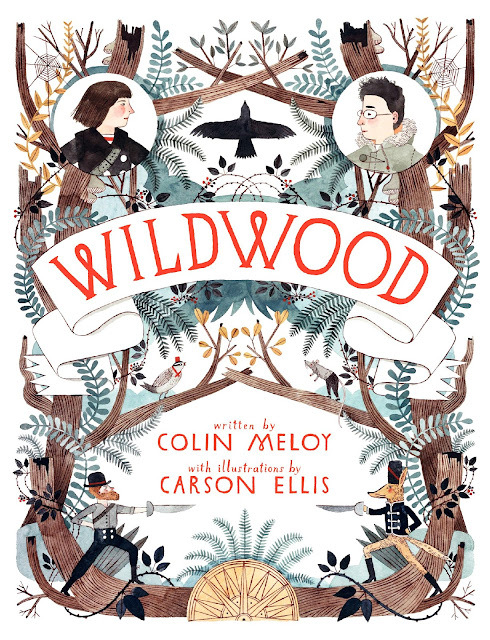 To pass the time Jacob and I are planning to read to each other from Wildwood, by Colin Meloy. It is a book we're both interested in reading, written by the lead singer in a favorite band we discovered not too long ago (The Decemberists). It is illustrated by his wife, who secured a place in my heart with her fantastic work on the first Mysterious Benedict Society book. Do you enjoy reading aloud? It's one of my favorite pastimes. It took a while, but I've finally convinced Jacob to listen to me while I'm doing it. Usually. Hi there! You won my giveaway over on www.rebeccalately.blogspot.com. Could you please e-mail me at rebeccalately@gmail.com? I usually prefer to read to myself. But then I get awfully car sick just sitting still so I could never read aloud in the car (I really wish I could read in the car). In those instance, I would be happy to have someone read to me. One of Neal's and my favorite car ride things is to get a book on CD or podcast and listen and pause every few minutes to discuss. We find Radiolab particularly enjoyable and thought-provoking. Rebecca -- awesome (even if it is off-topic)! I have emailed you. llcall -- Jacob and I love audiobooks, too! As long as they have a decent narrator. Sadly our CD player in the car just fritzed out. :( That's why we braved potential carsickness. Thanks for the tip about Radiolab, I'll check it out. Good luck on your trip & enjoy the book! Bethany I love that! I find myself interpreting what other readers say with different (better) inflection, too. And the book is good so far!